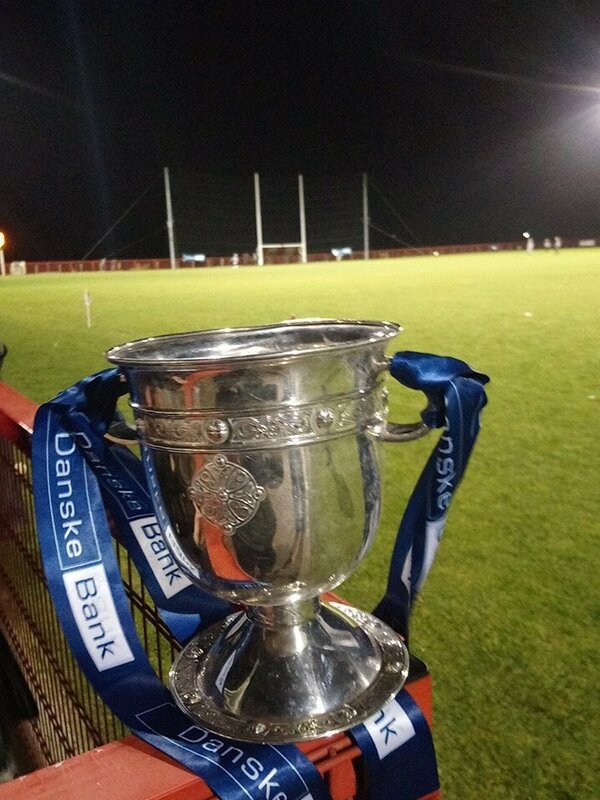 Dean Maguirc Carrickmore and St Pius X Magherafelt must do it all over again after a rip roaring Danske Bank Rafferty Cup final at Stewartstown last night. Even after extra time the sides couldn’t be separated with both management teams deciding that a replay was the fairest way to decide it as players from both sides were dropping with cramp. Wind assisted St Pius X led by four points at the break and they extended that advantage in the second period before Dean Maguirc staged a rousing comeback with the last five scores of normal time. St Pius X Magherafelt had the wind at their backs in the first half and while they led 0-7 to 0-3 Dean Maguirc Carrickmore created two good goal chances which they failed to take. The twin threat of Aaron Donnelly and Darragh Wade caused all sorts of problems for the Dean defence, the O’Donovan Rossa duo hitting all but one of their side’s first half tally between them. Wade hit the opening two scores of the game before Oran Toal and Lorcan McGarrity levelled matters. Wade and Donnelly both registered again while at the other end of the field Patrick Quinn and Cahir McAnespie had goal chances which they failed to take. Full forward Donnelly and Joey Devlin then pushed the Derry school five clear before midfielder Sean Conneely had the final say of the half from a placed ball to leave it 0-9 to 0-5 at the break. Conneely fired over a great score on the restart but St Pius X responded with points from Caolan McCann and Wade to go 0-9 to 0-4 in front in the 43rd minute. That proved to be their last score of normal time though as Dean Maguirc hit back. Conneely landed a long range free as well as a point from play with centre half back Quinn getting forward to score as well. Toal then converted a free before a Zak Devine shot was tipped over the bar by keeper Callum Lagan to leave it 0-9 each at the end of normal time. Dean Maguirc had the wind in the first period of extra time with Conneely landing a monster free and Devine pointing from play to leave them two in front at the break. Donnelly and Wade hit outstanding scores on the re-start to level matters before the latter put the Magherafelt boys in front. But Dean Maguirc had the final say with a neat point from Michael McElduff as both sides deserved to fight another day. Dean Maguirc Carrickmore: D McCrory, C Kelly, T Teague, C McAnespie, C Meenagh, P Quinn (0-1), D Morris, S Conneely (0-4, 2f), M McCann, Z Devine (0-1), M Rafferty, L McGarrity (0-1f), J Donaghy, C Cuddy, O Toal (0-4, 3f). St Pius X Magherafelt: C Lagan, F Glavin, R Laverty, D Mullan, E Johnston, M Rocks, C Dyson, C Crozier, M Forbes, M Doherty, C McCann (0-1), J Devlin (0-1), P Monaghan, A Donnelly (0-3), D Wade (0-7, 3f).